NETWORK FINALS: THE GOLDBERGS, SURVIVOR and SEAL TEAM gained 0.1 in final numbers, but CRIMINAL MINDS lost the same. CABLE HIGHLIGHTS: Wednesday cable was once again all about sports, with the MLB PLAYOFFS on top, TBS’s NLCS game at 2.01, and Fox Sports 1’s ALCS game at 1.30. ESPN’s NBA doubleheader was at 0.98/0.86. (Univision also aired a LIGA soccer match at 0.35.) The top rated non-sports telecast was Comedy Central’s SOUTH PARK, down 0.12 to 0.54, with lead-out BROAD CITY down a tick to 0.28. VH1 aired 2 episodes of BLACK INK CREW at 0.53/0.46, followed by an 11PM LOVE & HIP-HOP special at 0.36. Bravo’s REAL HOUSEWIVES OF NEW JERSEY edged up 0.02 to 0.46. On Discovery, GARAGE REHAB rose 0.04 to 0.39, and MISFIT GARAGE jumped a tenth to 0.36. 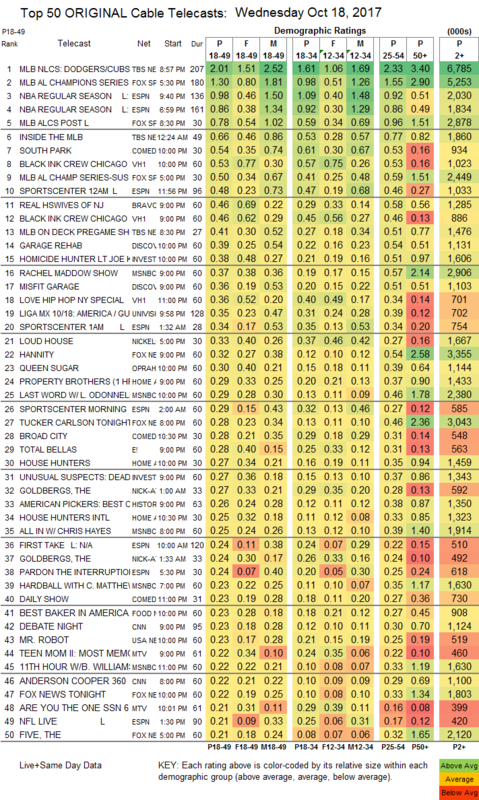 On ID, HOMICIDE HUNTER gained 0.06 to 0.38, and UNUSUAL SUSPECTS was up 0.05 to 0.27. MSNBC’s RACHEL MADDOW SHOW led cable news at 0.37/0.57/2.9M, with Fox News’s HANNITY at 0.32/0.54/3.4M, while CNN aired a DEBATE NIGHT special at 0.23/0.30/1.1M Despite some controversy due to allegations made against the series creator, Nickelodeon’s LOUD HOUSE was at 0.33. OWN’s QUEEN SUGAR dropped 0.03 to 0.30. On HGTV, PROPERTY BROTHERS ticked up to 0.29, HOUSE HUNTERS was down 0.02 to 0.27, and HOUSE HUNTERS INTL lost 0.02 to 0.25. 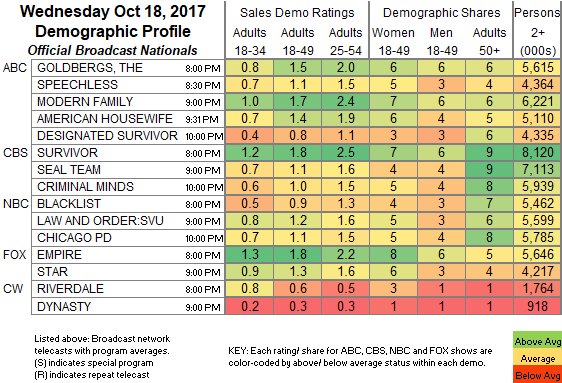 On E!, TOTAL BELLAS shed 0.02 to 0.26, and ERIC & JESSIE was down 0.05 to 0.13. Food Network’s BEST BAKER IN AMERICA climbed 0.05 to 0.23. USA’s MR ROBOT fell 0.07 to 0.23. On MTV, a TEEN MOM special was up 0.03 to 0.22, and ARE YOU THE ONE dropped 0.08 to 0.21. On Lifetime, LITTLE WOMEN: DALLAS ticked down to 0.20. CMT’s ARTISTS OF THE YEAR special was at 0.20. On BET, FACE VALUE and 50 CENTRAL were both at 0.14, each down 0.02 from last week. FXX’s YOU’RE THE WORST rose 0.04 to 0.14. Syfy’s CHANNEL ZERO dropped 0.04 to 0.14. Spike’s THE SHANNARA CHRONICLES was steady at 0.10. IFC’s BARONESS VON SKETCH SHOW gained 0.02 to 0.06. Off the chart, Sundance’s LIAR got perilously close to invisibility, down 0.01 to 0.01/100K.